Yuma county contains the city of Wray. Anthem BCBS has 2 unique providers in Yuma County. Anthem BCBS has 0 unique facilities in Yuma County. Anthem BCBS has 2 total unique providers + facilities in Yuma County. Bright has 0 unique providers in Yuma County. Bright has 2 unique facilities in Yuma County. Bright has 2 total unique providers + facilities in Yuma County. Cigna has 0 unique providers in Yuma County. Cigna has 2 unique facilities in Yuma County. Cigna has 2 total unique providers + facilities in Yuma County. Colorado Choice has 43 unique providers in Yuma County. Colorado Choice has 4 unique facilities in Yuma County. Colorado Choice has 47 total unique providers + facilities in Yuma County. Denver Health has 0 unique providers in Yuma County. Denver Health has 0 unique facilities in Yuma County. 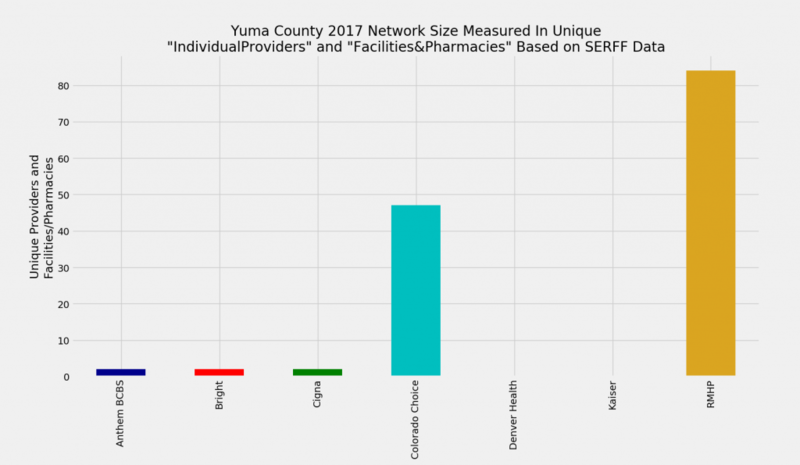 Denver Health has 0 total unique providers + facilities in Yuma County. Kaiser has 0 unique providers in Yuma County. Kaiser has 0 unique facilities in Yuma County. Kaiser has 0 total unique providers + facilities in Yuma County. RMHP has 76 unique providers in Yuma County. RMHP has 8 unique facilities in Yuma County. RMHP has 84 total unique providers + facilities in Yuma County.